Take everything you know about bladder infections in people and forget it. Cats get vastly different problems. However, while in people most bladder disease involves infection, this is often not the case in cats. In cats, there are several poorly-defined diseases with overlapping symptoms, difficult diagnoses, and less-than-ideal treatments. Because of this, they all get lumped together into a syndrome called Feline Lower Urinary Tract Disease, or FLUTD. Typically, cats with FLUTD will have recurrent episodes of bloody urine, painful urination, and urinating outside of the box. It is important to remember that FLUTD is a collection of symptoms, not a disease. There are several diseases, including some unknown diseases, that cause the symptoms of FLUTD. 1-5% will have a true urinary tract infection. 1-5% will have both a bladder stone and an infection. The average age for symptoms is 4 years. 50% will have true urinary tract infections. 10% will have bladder stones. 17% will have both infection and bladder stones. 7% will have urethral blockage. 3% will have urinary tract cancer. 5% will not have a cause that can be determined despite extensive testing. 66% will be in some stage of kidney failure. 5% will have urinary incontinence. Testing is used to help sort patients into the correct group. A urinalysis is commonly performed. With a 50% incidence of infection in older cats, antibiotics are often used in cats age 10 or more but they are used less often for a younger cat. Radiographs to rule out bladder stones might be performed, especially in older cats with recurrent syptoms. Older cats might also need blood testing to evaluate kidney function. Often testing other than a urinalysis is omitted for younger cats unless the symptoms become a recurring problem. It is important to know if the cat is urinating out-of-the-box because of a medical problem or a behavioral problem, and a urinalysis is one of the main ways we do that. Notice the large percentage of young adult cats for whom no clear underlying cause can be identified. The diagnosis for these cats is Idiopathic Cystitis, or IC. No, it does not mean your vet is an idiot because he can't figure out why your cat is having bladder problems. Idiopathic is a medical term that means "unknown cause." 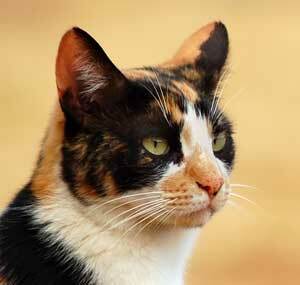 For cats with IC, there are many theories on how to proceed. 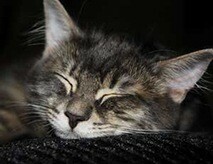 Stress is cats may not be what we as people typically think of as stressful. However, most clinicians agree that stress can play a major role in causing IC. Cats can have stress from social interactions, litterbox issues, environmental changes, inadequate hiding or resting spaces, etc etc. To help you evaluate potential stressors in your cat's environment, I recommend spending some quality time with the Ohio State University College of Veterinary Medicine's Indoor Pet Initiative, a website devoted to the needs of indoor cats. Click the link to visit the website. Start with the low-hanging fruit, and make as many changes as you can to reduce your IC patient's stress levels. Along with environmental modification, sometime we use anti-anxiety medications. Diet can play a role in the development of IC. We often start IC cats on Science Diet's C/D catfood. This formulation acts to reduce the occurrence of symptoms in several ways. Some cats with IC are very painful. In these cases, we often prescribe pain medications. Doing your best to increase water intake is often helpful. This can mean feeding canned food, trying out a cat fountain, etc. Most cases of IC will at least partially resolve in about a week. However, the symptoms often recurr at a later date. Environmental modifications, diet changes, and other treatments can help reduce or eliminate flare-ups. It is important to note that lower urinary symptoms in male cats can indicate a urinary blockage that is an emergency. If you’re not sure your cat is able to express urine, assume it could be an emergency and call your veterinarian’s office at once.